By this point, the Hunted story has developed a lot of moving parts. We're hearing from villains inside the trap, Kraven and his allies on the outside, Black Cat and Billy Connors double-trapped in Kraven's cages, and of course, Spidey himself, in the middle of it all. It's a real pleasure to have Spider-Man back in black for a dark story, and the visual and narrative tones line up nicely with the grim subject matter. This isn't an issue that abandons humour, but even the jokes have a bleak edge to them. Spidey's first and biggest villain interaction is a superb debate scene. He listens to the Vulture rally other captive villains with a wildly exaggerated tale of the Gibbon's heroic death and his own discovery of the weakness in the Robo-Kravens hunting them. This is where the dry humour comes in - Nick Spencer walks a wonderfully fine line by making the Vulture's tale almost believable but still absurd and unmistakably Vulture-y. 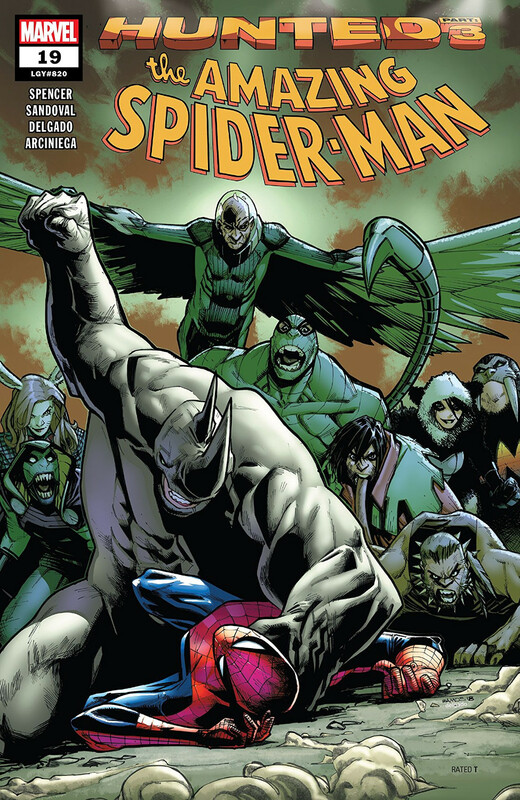 Spider-Man tries to contradict the Vulture and chart an alternate path for the abducted villains. How well does it work? Let's just say this is one of those issues where the cover is an exact recreation of things that happen inside. That core scene is highly satisfying, but all the other balls put in the air are worth paying attention to as well. Kraven and Kraven Jr have an illuminating (albeit not revealing) chat about the real motivation driving the Hunt. Black Cat does some superb jail-breaking and some half-superb babysitting with Billy. Taskmaster is busy lining up future complications in the form of another - vitally important - abductee. Visually, this issue delivers an impressively controlled performance. Gerardo Sandoval has a distinctive, instantly recognizable style. I have seen it go over the top in other comics and disliked the results. Here, though, he puts the story first. His characters are massive and exaggerated and heavy, but they are tightly chained to the story and the thread of the narrative whispers flawlessly from panel to panel. The result is a strong impression of continuous menace that perfectly suits the tone of the script. This issue is dark in a literal sense as well as a metaphorical one: This is a nighttime comic through and through. Edgar Delgado and Erick Arciniega amplify the heavy blacks in the artwork with a range of colours that is broad but appropriately muted for the low-light conditions. It's a conscious choice and an effective one; here again, the visuals are falling into lockstep with the story's grim spirit. The almost-oppressive atmosphere this issue generates in art and words carries on into the plot. While Nick Spencer's script delivers plenty of action and character work, this is, first and foremost, a mystery story. It's truly impressive that a single issue can capably summarize what we do know, hint intriguingly about what we don't know, and also let the characters do their own, satisfying detective work.